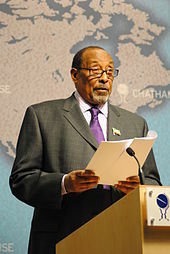 艾哈迈德·穆罕默德·马哈茂德, 4th President of the Republic of Somaliland, speaking at 漆咸樓 in 2010. Lamadaya（英语：Lamadaya） are waterfalls located in the 马多山脉 mountain. The 布拉奧 countryside en route to 柏培拉. View of the 马多山脉 Mountains, home to numerous endemic species. Somali goats in 阿里萨比耶, 吉布提. A flock of Somali sheep. ^ 3.0 3.1 According to article 7 of The Transitional Federal Charter of the Somali Republic 互联网档案馆的存檔，存档日期2008-12-18. : The official languages of the Somali Republic shall be Somali (Maay and Maxaatiri) and Arabic. The second languages of the Transitional Federal Government shall be English and Italian. ^ 4.0 4.1 4.2 4.3 4.4 Central Intelligence Agency. Somalia. The World Factbook. Langley, Virginia: Central Intelligence Agency. 2011 [2011-10-05]. 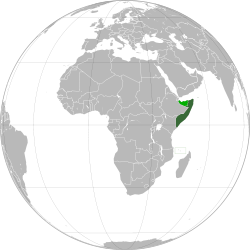 ^ The Federal Republic of Somalia is the country's name per Article 1 of the Provisional Constitution 互联网档案馆的存檔，存档日期2013-01-24..
^ ?. 新華社. （原始内容存档于2009-01-15） （中文（简体）‎）. ^ Vision 2016: Framework for Action 互联网档案馆的存檔，存档日期2015-07-13. ^ 《索馬里真相》將播出 導演講述拍攝經歷. 新浪網. 2011年10月6日 [2014年5月20日]. ^ 24.0 24.1 24.2 24.3 Dr Andre Le Sage. Stateless Justice in Somalia (PDF). Centre for Humanitarian Dialogue. 2005-06-01 [2009-06-26]. （原始内容 (PDF)存档于2012-01-18）.